From a management perspective this time of year can be a real challenge. After the first appearance of buds in the spring until full leaf development is achieved, no pruning can be done so I am limited in terms of what can be accomplished with timber-stand improvement practices. Additionally, the above average precipitation has made field work extra challenging -- stuck equipment and tire ruts are time consuming and unsightly. I mainly spend this four or so weeks mowing grass and treating garlic mustard. A benefit of seeking out errant garlic mustard plants is cruising the woods during morel mushroom season. 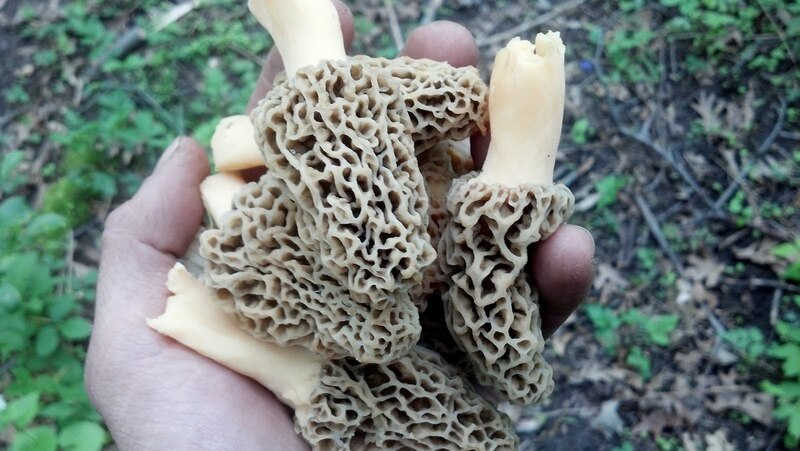 These morels were found under a recently dead American elm, a victim of Dutch elm disease (DED). DED is caused by elm bark beetles, which help spread a sticky, fatal fungus, and has nearly decimated elms across southern Wisconsin. Once elms reaches a certain size ("pole size"), it is nearly inevitable that they will be affected by DED and die. The good news is that elm reproduces quickly and is shade tolerant; the understory in much of our woods has an elm component. 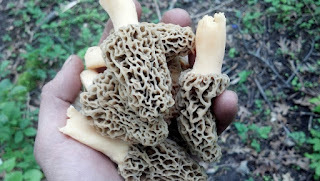 Perhaps more good news is that recently dead elm trees produce the elusive morel mushroom. This relationship is called mycorrhiza, or a symbiotic partnership that allows a fungus to grow from the roots of a plant. (More geeky science info here.) Interesting to note that apple, White ash and poplar trees can also host morels, and in the West, oaks are the root host. The particular stand where these morels were found is 11 acres in size and will be adopted by one of our partners, Walbridge School. The students there will help us figure out the management of this stand and whether we remove the elm understory or continue to allow its presence, recognizing that elm will never thrive because of DED. Stay tuned to hear how both the treatment of garlic mustard and DED proceeds. And if any additional edibles are found!